Get your logo and promotional message out there in amongst the crowd today with our unique and practical car sun shades. Our entire promotional car sunshade range comes custom-printed with your logo or advertising message- making sunshades an ideal way to advertise your business. Our promotional sunshades are available for windscreens, steering wheels and side and rear windows- allowing maximum exposure for your brand and message. 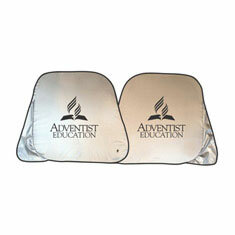 Each sunshade also folds for easy storage, making them both practical and convenient. 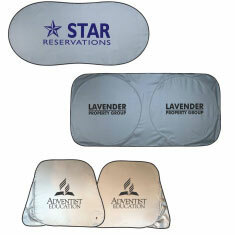 Have your brand traveling the streets with a customised car sun shade today! For a great gift pack, why not add a travel mug and promotional lanyards for car keys or name tags - your generosity will sure to be appreciated and your promotional message sure to go even further!